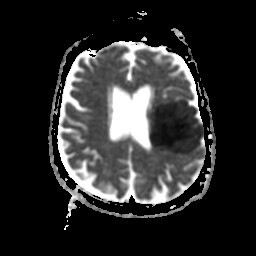 History: 70 year old male with acute right sided hemiplegia. 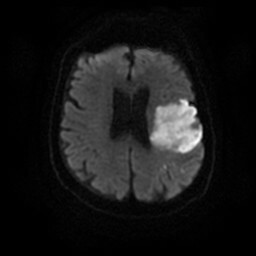 Diffusion Weighted axial MR image of the brain shows increased signal involving portions of the left frontal, parietal, and temporal lobes. ADC map in the same patient shows decreased signal (restricted diffusion) in the corresponding region of increased DWI signal. Many different entities can cause increased signal on diffusion weighted imaging. The differential diagnosis includes acute ischemic stroke, abscess, empyema, epidermoid cyst, lymphoma, intracerebral hematoma, encephalomyelitis, diffuse axonal injury, meningioma, and multiple sclerosis. An excellent article reviewing these entities is found here. The patient from which the above images were obtained suffered an acute left MCA stroke secondary to complete left internal carotid artery occlusion.